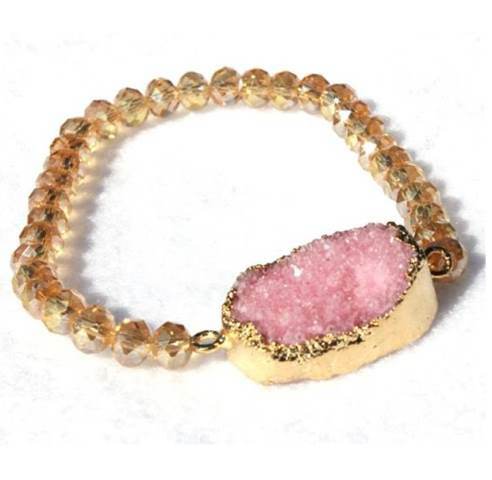 This eye-catching bracelet showcases a refined tan druzy pendant made of natural crystal quartz on a black (opaque) crystal bead stretch bracelet – perfect to wear solo or contrasted with additional bracelets. Silver tone backing on pendant. One size fits most. This eye-catching bracelet showcases a refined blue druzy pendant made of natural crystal quartz on a purple colored crystal bead stretch bracelet – perfect to wear solo or contrasted with additional bracelets. Gold toned backing on pendant. One size fits most.